a rich landscape of fountains, walkways and lush gardens. Crafted in the spirit of the Orient with dramatic architecture creating symmetry, guests arrive to discover a reflecting pool that draws the eye to the horizon and offers glimpses of the sea beyond. The subtly angled entrance leads to the impressive grand gallery, the vertebrae of the Arabian Court, linking the two wings of the property and guiding guests to the charismatic guest rooms and suites, all of which face Palm Bay, and feature a private balcony or terrace. 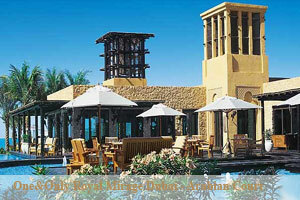 One&Only Royal Mirage is the ideal setting for meetings, conferences and product launches. Whatever the event, large or small, guests are ensured a memorable and distinctive experience. The Peregrine Ballroom at Arabian Court at One&Only Royal Mirage holds up to 200 people for dining, and there are two meeting rooms and a traditional meeting lounge. For sheer romance, few settings can match that of One&Only Royal Mirage. The experienced staff will ensure that your most important day goes off without a hitch and your guests will never forget sharing it with you.